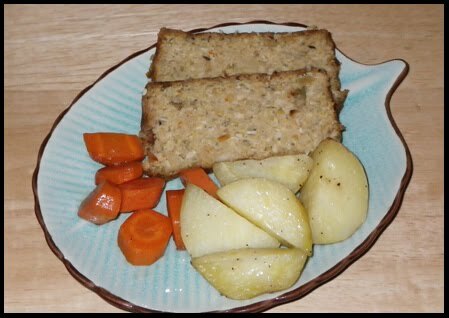 This recipe sounds weird, maybe even a little gross at first glance, but it makes delicious vegetarian meatloaf. So yummy! I've made it bunches of times already since Dave requests it weekly. I usually serve it with some kind of potato, or often with one of my favorite side-dishes--fried potatoes and cabbage. Don't be put off by the list of ingredients. In the end, it's really very tasty. Sounds odd but looks good. That sounds pretty good, and it looks like meatloaf! Very easy too; I was expecting a ton of veggies to chop.